Southern Cairngorms — one of the most remote places in the Scottish wilderness. I remember when I first had a look at a map of the area years ago, I was impressed how far some places were. An attraction of outdoor activities is to go somewhere other people would not, or even could not, go or reach. It is I think a major element in mountaineering, and it certainly is for me. When I first heard of White Nile in Garbh Choire Mòr from its very first ascentionist and my friend, Miles Hillman, it sounded very attractive. He said [it is in] probably one of the most remote corries of the Cairngorms . Indeed its UKC logbook pages lists only 1 record. That is an exceptionally small, or actually the smallest, number of records for a Cold Climbs classic, which usually attracts the UKC record of scores to hundreds of ascents. See 'Cold Climbs' ticklist; mind you, many of the routes that have only a handful ascents rarely come in condition, while White Nile must reliably come in condition every year, and perhaps for a prolonged time). A trouble is a difficulty in finding a willing partner, who is up for a tough walk-in to get to such a remote place, An Garbh Coire, as well as a mid-grade of V. Also, one can not expect to get any information about the current condition of the corrie, as understandably hardly any one pays a visit to the corrie, let alone publishes a report of it. There is always a risk routes may not be in condition. Understandably more climbers are put off because of that, while Norries and Ben Nevis are getting even more popular nowadays, partly thanks to the abundant condition reports readily available. 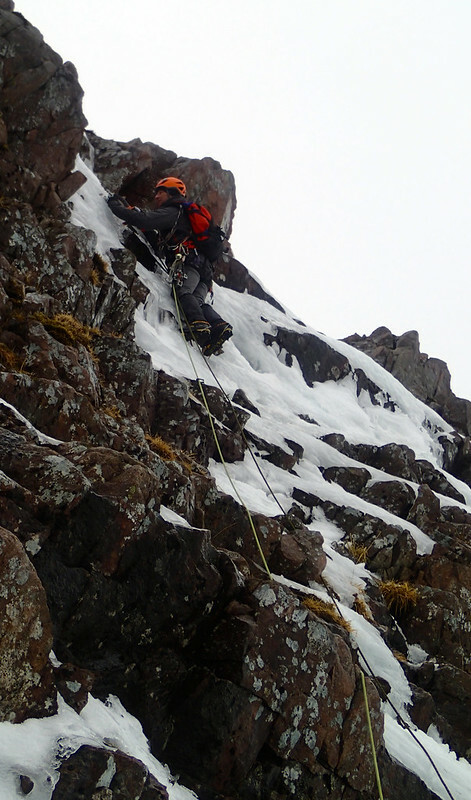 I was lucky this time; I have got Phil, and managed to convince him to venture out to An Garbh Coire. 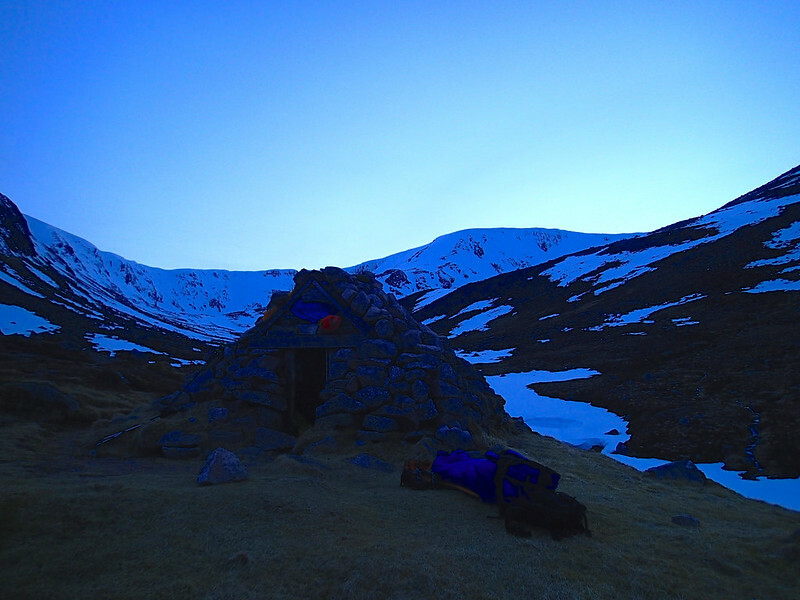 We planned to stay in the bothy there (An Garbh Coire Refugee) for 3 days. A potential trouble is the bothy is marked as ruin in the BMC map. A quick google search found it was there at least in 2012, as described in the blog post by Neil Reid. That is kind of promising, if not quite reassuring enough. But what's the problem? Mountaineering is an adventure with uncertainties. We just take a bivvy bag, and if the bothy is still there, that will be a bonus! And we won. The bothy was indeed still there! There was a thick layer of snow on the floor and it was apparent the building was not water-tight. Our bivvy bags turned out to be very handy. An Garbh Coire Refuge at sunset. In terms of the forecasts, the first (Saturday) and third (Monday) days looked decent for climbing, whereas the second day may be found to be a little too warm. To cut the long story short, we didn't do White Nile, due to the weather and route conditions. On the third day we even fled away from the corrie, after witnessing a big avalanche. Phil on a steep bit of P2 of Angels and Demons. However we managed to have a great day out on the second day. We knew if we were to do anything, we must make an early start and must do a north-facing ice route, given the warm forecast. On our way back on the first day, Phil spotted a line on the north face of Sgòr an Lochain Uaine (The Angel's Peak), which was Angel's Delight. But then we spotted other possibilities of new lines. In the end we agreed to go for the icy-snowy line closest from the bothy, which is actually the longest line, as it starts from the lowest part of the buttress (that is why it is closest from the bothy situated at a lower altitude!). Unfortunately the second day didn't start well. When the alarm went off, we heard blowing wind and rain, hitting the walls of the bothy…. That rather inspired us to go back to bed, but eventually made an unwilling move, as the wind eased a little. When we arrived at the starting point of the route, the temperature was 1 degC and ice was melting. It wasn't the most encouraging. But then we knew we would not turn back. Climb now. I set off for P1 for the steep icy-snowy climb, then Phil lead P2. The protections were not the most inspiring. In particular lack of availability of rock gear, due to poor quality of rocks, was both disappointing and frustrating, as we see rocks everywhere. At least climbing was a fun — more fun than it had appeared from below. 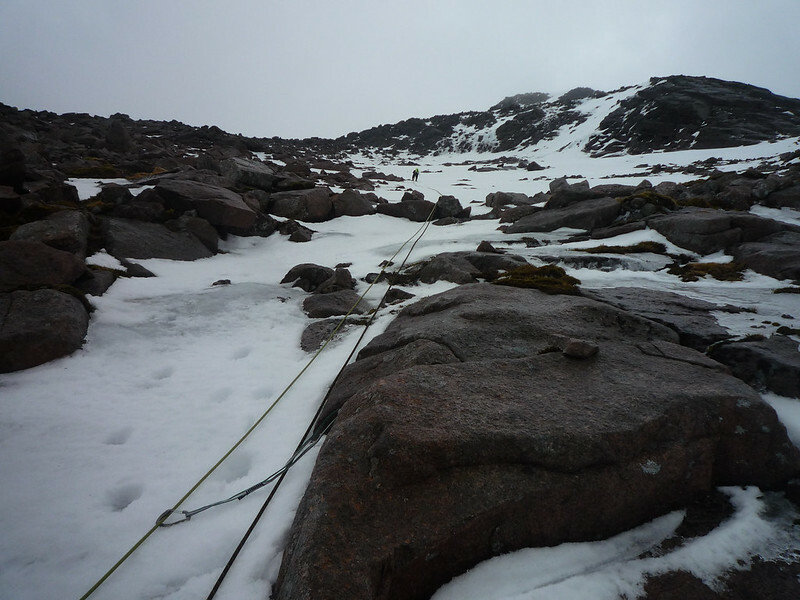 I took the easier (up to tech 3) last pitch (90 metres), moving together as the rope got taut. It turned out there was no nasty cornice. And all of sudden I topped out directly to the summit of Sgòr an Lochain Uaine! Our gloves were soaking wet by that time. The wind was blowing hard on the summit plateau. The fact both of us had somehow left the footbeds in our sleeping bags and had forgotten to put them back in our boots didn't help. Nevertheless we were happy! To have made the fist ascent of such a long and proper mountaineering route to top out to a Munro summit was quite special. Especially when it was done on such a poor weather day in one of the most remote corners of Highlands. We felt incredibly lucky to find such a hidden gem, really! Note: Originally, the route name and grade of Angel's Share (V/4) was given. However, it turned out there is the route of the identical name in the same buttress first ascended in 2012, so we have changed the route name. Also, it was suspected to be better protected in the typical conditions, so we have downgraded the route to IV/4. 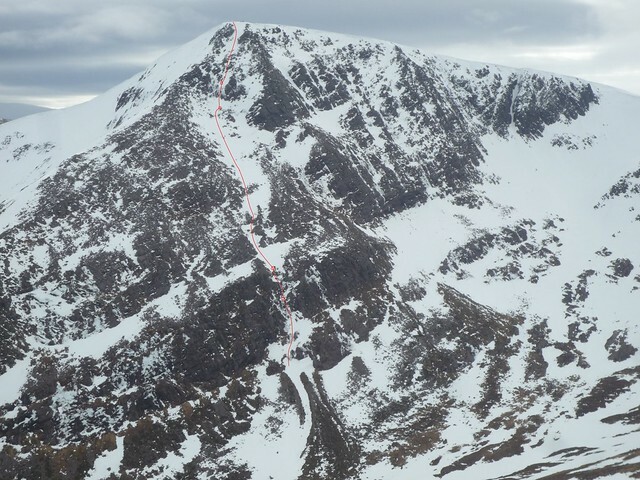 A fine mountaineering route that takes the longest line on the north face of The Angel's Peak (Sgor an Lochain Uaine), following the snow/ice all the way, and finishes at the summit of Munro. It is located at the leftmost edge of the north face buttress. P1+P2 (100 metres) are the narrowest and steep ice and snow (up to tech 4), followed by 200 metres of snow slope (tech 2), the second part of which is quite broad, then ice wall straight above (15 metres, tech 4, crux), and finally icy snow slope (90 metres, tech 3). There was hardly any cornice. The rocks around the route were mostly loose or shattered, or lack of cracks, and so offer few protections. Some turfs were quite thick and good, and so warthogs are useful.